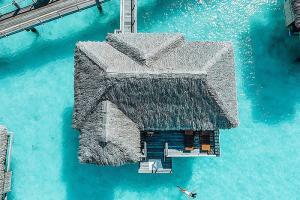 Surrounded by majestic views and a warm turquoise lagoon, Four Seasons Resort Bora Bora features 85 overwater bungalow suites, 15 overwater suites with plunge pools, 7 luxury beachfront villa estates and 1 private island. One, two and three-bedroom villas accommodate up to 6 adults. An award-winning spa and healing center includes massage, body treatments, facials and more. The perfect resort for a honeymoon, anniversary celebration or romantic getaway. On a private motu, 25 minutes from Bora Bora's main town (by boat). Lagoonarium, Mount Otemanu, Mount Pahia, Point Matira.